It’s not often that a work of fiction generates such a frenzy of attention that the Vatican itself is compelled to comment on its contents, but that’s what happened in the aftermath of the release of Dan Brown’s novel The Da Vinci Code in 2003. The book, which offers controversial theories about subjects as wide ranging as the life of Jesus Christ, the nature of the Holy Grail, corruption within the Catholic church, the roles of several Masonic orders, and the legacy of artists and scholars such as Isaac Newton, Claude Debussy, Victor Hugo, and Da Vinci himself, has sold more than 40 millions copies world-wide, making it one of the most successful books of the 21st century. Critics have denounced it as a work of poorly-written fiction whose subject matter is tantamount to blasphemy; admirers of Brown’s work have lauded it as an enjoyable work in its own right, which as well as being a thrilling page-turner, highlights a number of important questions which scholars of world history have been asking for many years. I personally enjoyed it immensely. Director Ron Howard’s film is no less controversial, having already been denounced by religious folk as soundly as the book was, despite no-one having actually seen it yet. The film stars Tom Hanks as Robert Langdon, a Professor of Religious Symbology at Harvard University, who becomes involved in a dangerous mystery when Jacques Saunière, the renowned curator of the Louvre in Paris, is found dead in the Denon Wing of the museum, naked and posed like Leonardo Da Vinci’s famous drawing the Vitruvian Man, with a cryptic message written beside his body and a Pentagram drawn on his stomach in his own blood. Teaming up with Saunière’s granddaughter Sophie Neveu (Audrey Tautou), a French government cryptographer, Langdon quickly finds himself searching for both Saunière’s murderer, and the reason he was killed – all the while trying to stay one step ahead of dogged detective Bezu Fache (Jean Reno), who thinks Langdon is the murderer, and a shadowy albino monk named Silas (Paul Bettany) who, for reasons unclear, wants Langdon dead… The film also stars Ian McKellen, Alfred Molina and Jürgen Prochnow, and is set for world-wide release on 19 May 2006. The choice of Hans Zimmer as the composer of The Da Vinci code was an unexpected one. Ron Howard’s usual collaborators are James Horner and Thomas Newman, both of whose musical styles would seem to suit the nature of the film perfectly. This is not to say that Zimmer can’t score intelligent, thought-provoking mystery/thrillers, because he can, and Zimmer has worked with Howard before, on Backdraft back in 1991. It’s just that, based on his recent musical choices (Cinderella Man, The Missing, A Beautiful Mind), Howard seemed to have found his comfortable collaborators of choice, having only worked with one other composer (Randy Edelman on Ed TV) in the preceding decade. In many ways, Zimmer’s The Da Vinci Code is a re-working of the heavy string stylings he previously incorporated into scores such as Hannibal and The Ring, albeit with a slightly more spiritual flavour this time around. Zimmer’s intent here, though, is not to elicit feelings of fear or dread, but feelings of uncertainty, discovery, wonderment, and above all intelligence. This is a high-brow score for a film with a high-brow concept. For the most part, Zimmer adequately achieves all these aims, and writes a score which is dramatically appropriate, and perfect for the tone of the film, with several moments of dramatic power and great beauty. Unfortunately, in broad terms, it’s just not satisfying enough as an overall listening experience. When scoring films of this type, Zimmer’s music has tendency to drone, as though he is trying so hard to rein in his ‘big theme’ tendencies that he over-compensates by not writing anything which may overpower the story, resulting in a score which can, at times, seem bland. This is the case here. Several cues, notably “The Paschal Spiral”, as well as large sections of the lengthy “Ad Arcana” and “Rose of Arimathea”, consist of little more than endless layers of textured string writing, full of the rather “thick” orchestral layers Zimmer often employs, underpinned by a grinding bass, subtle electronic enhancements, and a distant cooing choir to illustrate the ecclesiastical nature of the film. The album as a whole tends to blend into itself, with no distinct lineage between cues, or real sense of recurring themes or motifs, giving the album the feeling of one long classical work rather than a soundtrack album made up of individual elements. I haven’t decided whether this is a good thing or a bad thing in this instance, but it’s something Zimmer does regularly. This is not to say that the score is without merit, though – on the contrary, there are several passages of undeniably excellent music which convey a perfect sense of reverent introspectiveness coupled with an overarching feeling of mystery and danger. The large crescendo towards the end of “Dies Mercurii I Martius” is unexpectedly bold and theatrical, while the modest action music in “L’Esprit de Gabriel” adds an element of excitement and rhythmic motion to score which, at times, has a tendency to be rather static. A tragic, bittersweet combination of strings, solo voice and harp appears during the opening moments of “Fructus Gravis”, before heading off into a Herrmann-inspired scherzo, the first of many subtle references to the great man’s work throughout the score – the skittery “Beneath Alrischa” later on revisits the style to pleasing effect. Other highlights include Martin Tillmann’s gorgeously rich and sonorous cello solo half way through “Ad Arcana” and during the emotionally powerful “Daniel’s 9th Cipher”, the searching choral surges during “Malleus Maleficarum” (which is oddly reminiscent of parts of Crimson Tide) and the dynamic “The Citrine Cross”, the portentous Latin chanting in “Salvete Virgenes” (a bonus track which does not feature in the film, with lyrics by Abhay Manusmare, who until recently was Zimmer’s newest assistant at Remote Control Productions), the gentle ‘ancient strings’ in “Rose of Arimathea”, and the rather uplifting and celebratory finale, “CheValiers de Sangreal”, which comes complete with resplendent tolling bells deep within the mix. The two best cues, by a long stretch, are “Poisoned Chalice” and the conclusive “Kyrie for the Magdalene”. The former is a heart-breakingly beautiful operatic aria, performed with crystal clarity and deep emotion by Israeli soprano Hila Plitmann, accompanied a resonant male voice choir and a stirring string motif strikingly but surprisingly reminiscent of James Horner’s Star Trek II. The latter, ironically, was not written by Zimmer but by English composer Richard Harvey, best known internationally for his work on the Hallmark TV movies Animal Farm and Arabian Nights, and is a stunning plainsong-inspired liturgical lament which the internationally celebrated modern choral composer John Tavener would be proud to call his own. 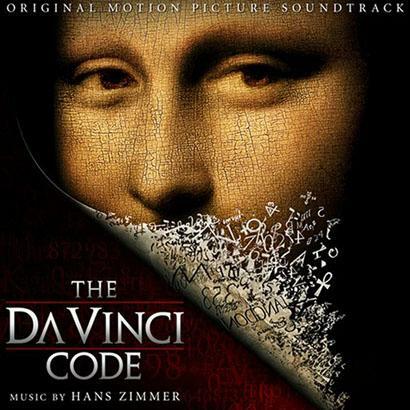 As usual, one has to wonder how much of The Da Vinci Code was written by Zimmer and how much was a “team effort” from his usual collaborators and conspirators: Jim Dooley, Blake Neely, Bruce Fowler, Justin Caine Burnett, Harry Gregson-Williams, Rupert Gregson-Williams, Steve Jablonsky, James Levine, Henning Lohner, Suzette Moriarty, Heitor Pereira, Geoff Zanelli, Lorne Balfe, Henry Jackman, Mel Wesson, and even James Newton Howard are all thanked in the CD’s copious credits, drawing one to the conclusion that some or all of them probably had a hand in writing or orchestrating parts of the score. Ultimately, though, who wrote what probably doesn’t matter. Fans of Zimmer’s serious and more mature writing, especially the aforementioned Hannibal, will find much to enjoy in The Da Vinci Code. It’s during scores like this, when the textures are so luxuriant and the mood so perfect, that one realises why Zimmer is held in such high regard by people in Hollywood and beyond. Technical qualities aside, however, I found the score to be something of a chore to sit through, and by the 45-minute mark I had honestly had enough, despite there still being another 25 minutes of music to go. Though I can’t fault the obvious care Zimmer took to remain respectful, appropriate, and true to the source material, and though parts of it are undeniably brilliant, I still can’t help but wonder what Horner, Newman, or even one of Howard’s early collaborators Lee Holdridge, might have written. Music composed by Hans Zimmer. Conducted by Richard Harvey. Featured musical soloists Martin Tillman, Hugh Marsh and Thomas Bowes. Special vocal performances by Hila Plitmann and Delores Clay. Choir conducted by Nick Glennie-Smith. Latin lyrics by Graham Preskett. Recorded and mixed by Geoff Foster, Al Clay and Alan Meyerson. Edited by Bob Badami. Album produced by Hans Zimmer and Mark Wherry. I seriously enjoyed this soundtrack. I agree with the review, but it is highly recomended. Good review, Mr. Broxton. But in your mentioning of the “best cues” on this score, you conspicuously omit “Chevaliers de Sangreal”. In the opinion of many, this is one of the strongest cues of Zimmer’s career. Why was this? Did you find it too similar to previous work?